The day after the Fatima Bint Mubarak Ladies Open finished, Saadiyat Beach Golf Club hosted the Gary Player Invitational, to celebrate the union of golf and giving. Despite taking place just hours after hosting the LET event the course was in amazing condition, with quick and smooth greens on offer to all golfers. Eddie Pepperell’s team was able to come out on top as a result of their calculated approach to tackling the strategically designed course at Saadiyat Beach Golf Club. If these two tournaments were not enough, Abu Dhabi was once again graced with its headline tournament from 16-19 January. Abu Dhabi Golf Club lived up to its name as the ‘Home of Champions’ once again as it welcomed Europe’s elite along with star players like Dustin Johnson, Brooks Koepka and Haitong Li for another thrilling opening to the European Tour’s ‘Desert Swing’ at the Abu Dhabi HSBC Championship, presented by EGA. While these events were taking place, an important relationship was being developed in the background, with Etihad Airways renewing its partnership with Abu Dhabi Golf Club and Saadiyat Beach Golf Club for another three years. This relationship reinforces the airline’s continued commitment to golf in the nation’s capital as well as its determination to develop Abu Dhabi as a tourist destination for golfers and non-golfers alike. With flight times of around 7 hours to Abu Dhabi from most of Europe and Asia, this relationship will hope to see an influx of holiday makers travelling to the capital year on year. Looking forward to the next month; the Abu Dhabi Pro-Am, presented by Troon Golf is the fourth event in quick succession that will take place in Abu Dhabi. This event will run from 3-6 February and will feature 18 teams comprised of club professionals, aspiring playing professionals and their three amateur partners. The tournament will feature two rounds of golf at Saadiyat Beach Golf Club and one round at Abu Dhabi Golf Club, giving the players a full experience of the amazing golf in Abu Dhabi. With the tournament season over; tourists have flocked back to Abu Dhabi to hone their skills. With three courses available to them, including: Abu Dhabi Golf Club, Yas Links and Saadiyat Beach Golf Club, it is a golfer’s paradise. Although golf has made the headlines in Abu Dhabi recently, visitors should not forget about the incredible culture which can be taken in away from the golf courses in Abu Dhabi, including Louvre Abu Dhabi, Sheikh Zayed Grand Mosque and the Yas Island attractions. 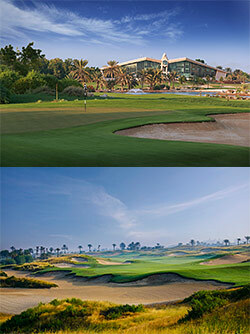 For more information about Abu Dhabi Golf Club click here. For more information about Saadiyat Beach Golf Club click here. With global headquarters in Scottsdale, Arizona, Troon is the world’s largest golf management company, with more than 270 golf courses in its portfolio. Also specialising in homeowner association management, private residence clubs, estate management and associated hospitality venues, the company oversees operations at Troon Golf, Honours Golf and Troon Privé properties located in 36 states and 31 countries. Additionally, 56 Troon facilities featuring 79 courses enjoy a Top 100 ranking by national or international publications. With Headquarters in Geneva, Switzerland and Dubai UAE, Troon International is committed to developing Troon’s presence throughout the world. This rapidly expanding division now oversees operations at 47 courses in 18 countries including England, Scotland, Spain, Norway, the United Arab Emirates, Australia and South Korea with further expansion planned across all regions.